How Many Distinct Symbols Do You See?? Most people readily recognize that the Star of David, the national symbol of Israel, is apparent in the symbol. However, what is less intuitive is that the Star of David is NOT an additional or separate part of the overall symbol.... it is rather MADE by the combination of two other symbols. What is commonly recognized as a MENORAH with a triangular base, a distinctly JEWISH symbol. Ephesians 2:11-22 Therefore remember that you, once Gentiles in the flesh--who are called Uncircumcision by what is called the Circumcision made in the flesh by hands-- 12that at that time you were without Christ, being aliens from the commonwealth of Israel and strangers from the covenants of promise, having no hope and without God in the world. 13But now in Christ Jesus you who once were far off have been brought near by the blood of Christ. 14 For He Himself is our peace, who has made both one, and has broken down the middle wall of separation, 15having abolished in His flesh the enmity, that is, the law of commandments contained in ordinances, so as to create in Himself one new man from the two, thus making peace, 16and that He might reconcile them both to God in one body through the cross, thereby putting to death the enmity. 17And He came and preached peace to you who were afar off and to those who were near. 18For through Him we both have access by one Spirit to the Father.19 Now, therefore, you are no longer strangers and foreigners, but fellow citizens with the saints and members of the household of God, 20having been built on the foundation of the apostles and prophets, Jesus Christ Himself being the chief cornerstone, 21in whom the whole building, being fitted together, grows into a holy temple in the Lord, 22in whom you also are being built together for a dwelling place of God in the Spirit. You see, God has made ONE NEW MAN from TWO distinct parts.... Jewish and Gentile believers in ONE BODY of MESSIAH.. Many in the Church today feel that "we Gentiles" as the Church have somehow replaced national Israel and the Jewish people in terms of the covenant promises of God... and this has in turn affected how many read and interpret the Bible in regard to Israel. A Messianic Seal from the Christian church in ancient Jerusalem has been rediscovered after 2,000 years. This ancient symbol was found on Mount Zion. It is believed to have been created and used by the Jewish believers who called themselves Nazarenes in the first Messianic Church. Three companies -- Olim Creative Products of Tiberias, News About Israel (NAI) of Jerusalem, and Christian Floral Delivery of Colorado -- jointly announced the discovery of this ancient symbol, which has been copyrighted by NAI. It consists of three separate but integrated symbols: a menorah at the top, a star of David in the middle, and a fish at the bottom. In each of the renditions of the three-part symbol the star is created by interlacing the stand of the menorah with the tail of the fish. The Messianic Seal was found etched or inscribed on eight ancient artifacts. The artifacts were presented to Ludwig Schneider, editor in chief of NAI's magazine Israel Today, in 1990. They came from Tech Otecus, an elderly monk who lived as a hermit in the Old City of Jerusalem. Otecus said that in the 1960's he had personally excavated about 40 artifacts bearing the Messianic Seal from an ancient grotto located in the immediate vicinity of the Upper Room on Mount Zion. What was once the main entrance to the grotto is now covered with a jail-like heavy wire mesh enclosure. Its door, leading down into the ancient baptismal place, is tightly secured with a heavy chain and lock. According to Schneider, the last remaining entry to the grotto was sealed shortly after he excitedly told the priests at the local monastery about the discovery of the Messianic Seal. Schneider photographed eight artifacts which were given to him by Otecus, and showed the pictures to the curator of the Israel Museum. "When he had carefully studied my pictures," Schneider recalled, "the curator immediately promised me that these artifacts and their unique symbol were an important find. He told me that the museum already had seen other artifacts bearing the same three-part symbol from some other sources he did not specify." 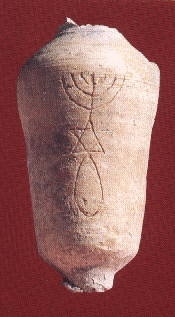 According to Bob Fischer, president of Olim Creative Products and co-author with local historian and artist Reuven Schmalz of their book, The Messianic Seal of the Jerusalem Church, the ancient three-part symbol has, since 135 AD, been suppressed by various Israeli groups or agencies, such as the Israel Museum and Orthodox rabbis in the Old City of Jerusalem, while simultaneously being buried for these nearly two millennia by the church. According to Fischer, at least two of the eight artifacts were obviously ceremonial pieces which may well have been used by James the Just, the brother of Jesus, who is said to be the first pastor of the church, or perhaps even by one or more of the Twelve Apostles. One of the eight artifacts is a brick-sized block of well-worn local marble. This piece bears an etched version of the Messianic Seal with a Taw (the last letter in the ancient Hebrew alphabet that looks exactly like a sign of the cross) in the eye of the fish symbol, as well as the ancient Aramaic lettering proclaiming the use of this artifact as a stand to hold a vial of anointing oil. The ancient Aramaic is transliterated as, "La Shemen Ruehon" (For the Oil of the Spirit). Another of the eight artifacts is a small, almost intact, vial which could well have sat on top of the marble stand. Commenting on what he characterized as the "monumental importance" of this archaeological discovery, Fischer said, "Beyond the historical background of the Nazarenes, the first Jewish believers who founded the Jerusalem Church, the Messianic Seal itself proclaims to the world the pervasive Jewishness of Jesus Christ and the decidedly Jewish foundation and roots of the church founded in His name. The Messianic Seal of the Jerusalem Church," Fischer continued, "strikes at the very roots of anti-Semitism while proclaiming a compelling message that restores unity: Jew with Jew, and Jew with Gentile. The importance of this discovery cannot be minimized. The Messianic Seal is not only just the key to understanding the Dead Sea Scrolls, it can and should shake the foundations of the church and orthodox Judaism with its incredible message of unity and love. It breaks down barriers that have existed for millennia and points the way toward restoration." Yes, this symbol does give us an understanding, visually, of how the EARLY church viewed itself. When we understand that this was a prominent SYMBOL for Messianic followers of Jesus (as opposed to the more modern Christian use of the fish by itself), we may infer their understanding that Gentile believers were grafted into and were spiritually a part of Israel by means of faith in Yeshua of Nazareth, the Son of God. Instead of just the Jewish people being the "covenant" people of God (i.e. ISRAEL), now BOTH Jewish and Gentile believers in the Messiah could be part of the SAME FAMILY of FAITH, the SAME INHERITANCE, and the SAME OLIVE TREE by the CROSS. Paul says that we (Gentiles) have been BROUGHT NEAR by the blood of Messiah... we are no longer STRANGERS and FOREIGNERS of the household of God (the Children of Abraham, Isaac, and Jacob). Now, we are fellow citizens that are being fitted into the holy temple that is founded upon the prophets, apostles, and Jesus the Messiah Himself (who, if you have not taken the time to notice, are ALL Jewish). This symbol may cut cross-grain with the notion that somehow the church has "replaced" Israel in God's operation and promises. Instead, God has called (the predominantly Gentile church) to come along side those of Israel who do not believe (yet) to intercede for them, witness to them of Jesus as the Messiah, help materially, and bless them till they find their restoration as a nation of priests unto the Lord. It vitally re-establishes the fact that the "CHURCH of Jesus" should be the strongest ally of the Jewish people and Israel itself--especially given the world tide against them. It reminds us that we are Gentiles grafted as a "wild" BRANCH into a Jewish vine. We did not replace the vine--and, more importantly, not ALL the Jewish branches have fell off either, only some... (Romans 11:11-24) Some branches have remained, all throughout history, and many Jewish people today are embracing Jesus (Yeshua) as the true Messiah. We as Gentile believers in the Jewish Messiah have been BROUGHT NEAR, MADE MEMBERS of the COMMONWEALTH of ISRAEL (the HOUSEHOLD OF GOD), by our faith in Jesus. Jewish believers in the Jewish Messiah have been BROUGHT to true fulfillment of the LAW by their faith in Jesus as well. Both groups (as Paul says further in Romans) are under the condemnation of sin and both groups need salvation by faith in Jesus, the Messiah, based on His atoning work. We are one family now by this common faith-- what Paul also calls the "One New Man". It is the ONE NEW MAN that this symbol of the "early" (predominantly Jewish) church so clearly illustrates. We as Gentiles believers have become a PART of the same heritage that Israel has... our spiritual roots are NOT in Rome, Tulsa, Colorado Springs, or Constantinople... IT IS IN JERUSALEM! Read more about the Jewish Roots of Christianity on our site link.